Express your emotions to your special one by gifting this cake on her special day. 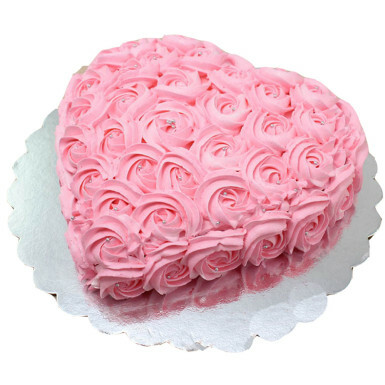 This amazing cake is in the shape of a heart is just the right thing to order on occasions like Valentine’s Day, Birthday, anniversary, kiss day, propose day and many more. This wonderful strawberry rose cake is juicy and you will definitely love the taste of it on your lips. The cake is an enticing blend of luscious texture, heavenly taste and the never-ending promise of love. Eggless cake is also available and for this you have to click on checkbox button. You can also customize your cake according to your choice. Extra charges will be charged for changes. Celebrate your love with this delightful cake and capture memories which will remain lifetime.